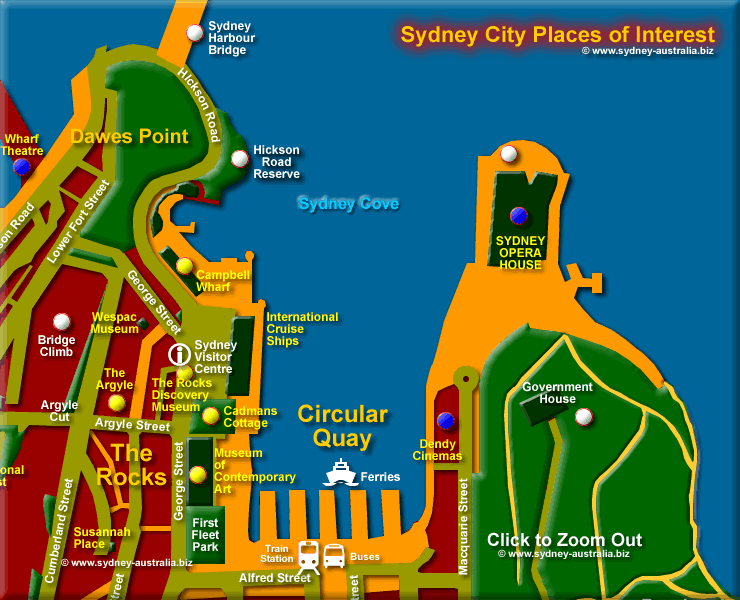 Sydney Cove is where the First Fleet convicts and their guards set up the penal settlement on 26 January 1788, after finding that the initially planned area of Botany Bay lacked drinking water. At the cove, located in Port Jackson (now commonly referred to as Sydney Harbour) they found a deeply forested area fed by a crystal clear stream that flowed northwards. Slowly at first, but quickly gathering pace, the settlement, then town and not much later the city of Sydney developed into what it is today. The streets nearer to Sydney Cove grew haphazardly from footpaths to lanes, then small streets, with lots of bends. They are still there today, particularly in The Rocks, the district to the west of the cove and to the south, now the more prestigious part of the Sydney Central Business District (CBD). Next Picture: Farm Cove and the Royal Botanic Gardens - Farm Cove and the Royal Botanic Gardens. Previous Picture: Darling Harbour Entertainment District - Darling Harbour Entertainment District. After the arrival of Major-General Lachlan Macquarie in 1810 to take up the position as fifth governor of the Colony of New South Wales, the town grew into a city, largely due to his vision and ability to plan. With longer, straight streets southwards from Margaret and Hunter Streets, development was more orderly, particularly along today’s main streets of George, Pitt, Castlereagh and Elizabeth. The west side of the cove was reserved for the government, the prominent hill is where Government House still stands today. Surrounded by parkland and the Royal Botanic Garden, there are fantastic views to had here and around Farm Cove. The Sydney Opera House features prominently on the east side of Sydney Cove. Offering not only opera, it is actually an important entertainment centre with movies, concerts and theatre for the city. The building itself is also Sydney’s iconic attraction, ranked amongst the world’s most famous buildings. Circular Quay is a major terminus for ferries, buses, trains and taxis. You can catch ferries to Manly and other north side suburbs on the harbour. Buses can take you from here to as far as Bondi and the eastern suburbs. Other attractions located here are the Museum of Sydney, the Justice & Police Museum and Customs House. The Royal Botanic Garden also has places of interest, such as the Tropical Centre and the Fernery, as well as numerous exotic and Australian plants, trees and flowers to see. You can find the Sydney Visitor Centre at The Rocks on the north end of George Street, near Sydney Cove. They have all the info you need for a great visit to this city and surrounds, as well, they have wonderful displays of historical artefacts from our past. Well worth a visit! The Rocks, a restored historical district, is a good place to begin exploring the history of Sydney. This is where the convicts of the First Fleet were first told to build shelters for themselves after arrival.